The shopping area of Triana is situated around the same shopping street Calle Triana and close to the historic Vegueta. 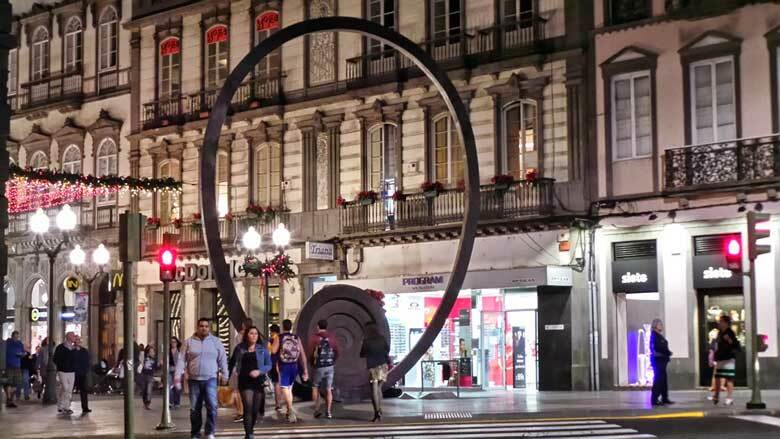 Triana is located in the heart of Las Palmas. From the Parque San Telmo, you’ve been overlooking Calle Triana. Since 1852 began shops and banks to settle here. 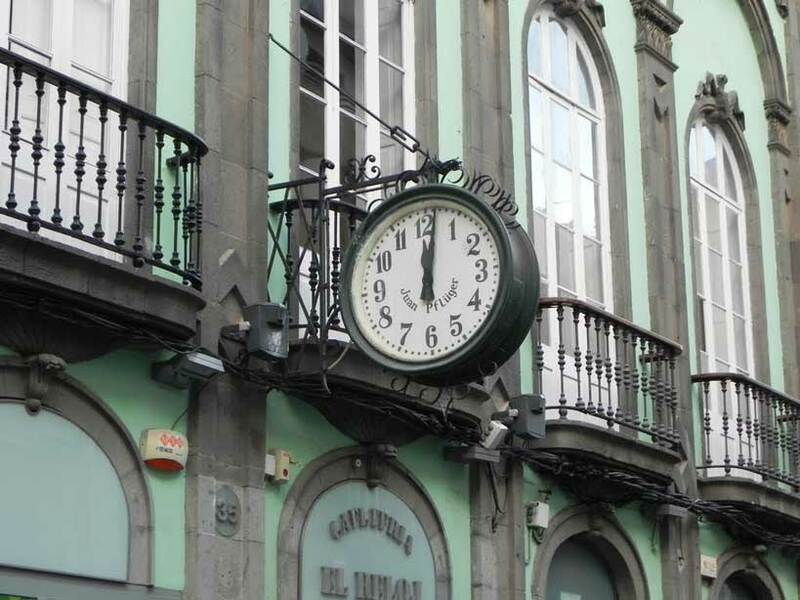 An important historical object at Triana is a lovely round clock. On the wall of the house number 35 in Calle Mayor de Triana, which dates from 1868, can you see this electric clock that was designed by the famous clockmaker Juan Pflüger. A clock that shows you that you should take the time to enjoy all that beauty. And the inhabitants of Gran Canaria indeed the other canary islands takes this literally. Here, everything goes with tranquility. You know what they saying about Spaniards, “Manana” which simply means “we see tomorrow.” The people on the streets here are very friendly and helpful. 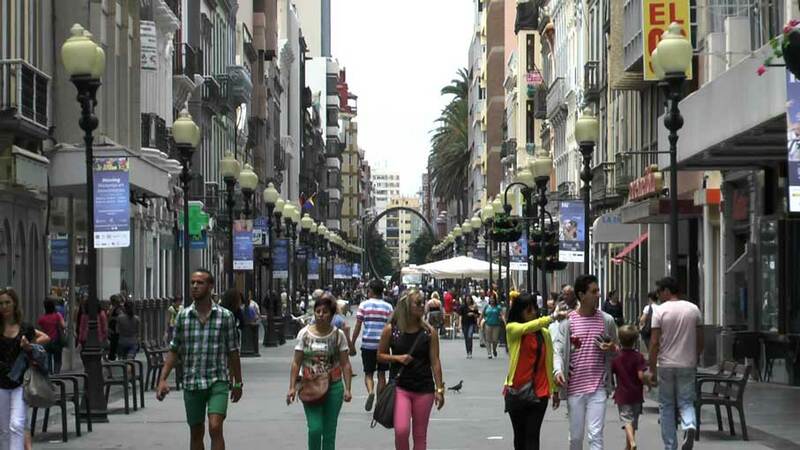 It is the ideal shopping area to discover the real Las Palmas. Every first Sunday of the month is Shopping Party. The stores are then open from 11:00 to 18:00. Not to forget are the numerous children’s events and concerts during the month of August. The last weekend of the month of May there is the Festival Tiempo para La Paz. an event that takes place in Parque San Telmo. Music, concerts, children’s entertainment, food and drink and attract many residents and tourists to this city festival. The side streets of Calle Triana such as Calle Perez Galdos, also did not secrets for you. It’s like Calle Triana a pedestrian street. It seems that you walk around in a quiet traditional village, but this is not true, this is a metropolis. Old colorful houses, benches at regular intervals where trees give you shade, frankly, that’s pure enjoyment of Triana. Tapas bars, restaurants and traditional but contemporary shops welcome you. For children there is a fun toy shop. The scent of flowers at the iron balconies make shopping more enjoyable, the pavement cafes middle of the street reinforce the holiday feeling. The rustic Calle Cano is such another beautiful example of Canarian culture. Calle Triana and the surrounding area smells like southern odors, it lives here every day. Not only the scent of flowers you can smell here, even the restaurants entice you happy with the perfume of spices. Restaurants and fast food bars making sure you are not hungry. Suggestions be Cano, Travieso, Torres, Restaurant Allende But also the other eateries giving the best on the menu. Here you snuff the typical canary cuisine odors. Lusts the children not the typical Canarian cuisine than is there McDonalds which will meet their needs. Be shure to taste the sandwiches (bocadillos) with fish or cheese, they are heavenly delicious. From a terrace you can enjoy a tasty homemade cake or chocolate with a bag cappuccino or latte macchiato or a homemade ice cream to eat an ice bar. Calle Triana is pedestrianized which also makes it safe when children go shopping with you. Here and there are toys for tots. Street performers spoil you with their arts or music. During the winter Calle Triana is richly decorated with Christmas lights, a must when you spend the winter on Gran Canaria. In earlier times, was driving here a tram through this shopping street, today this is history, but there are to be found here and there still remains of this magnificent era. More information about the zone Triana you can be found on their website (in Spanish language). A tourist map of the commercial zone Triana issued by Ayuntamineto the Las Palmas with all commercial matters, information, bus stops and a map can be downloaded here and here. Other attractions in the area Triana are Casa Museo Pérez Galdós (museum), Teatro Perez Galdos (Theater), Parque San Telmo, Ermita de San Telmo, Plaza de Cairasco, La Alameda de Colón (Columbus statue) and the Iglesia de San Francisco (church).